Earlier this week, on the Zentangle® Mosaic® app, founder Maria Thomas shared one of her first tangling pieces from very early in The Zentangle Method®’s history. She encouraged us to share our firsts. As I read through descriptions of uploaded first works, I marveled at how many tanglers were introduced to Zentangle through use of the book One Zentangle a Day, by Beckah Krahula. Individuals who had not been able to locate a CZT (that’s Certified Zentangle Teacher) began their tangling journey using that book One Zentangle a Day was published in 2012, four years before the more comprehensive Zentangle Primer, Vol. 1 came out. Although Suzanne McNeil had been publishing thin workbook-style books for several years by then, it did not take a rocket scientist’s math abilities to realize that Krahula’s book was more cost-efficient and comprehensive than twelve workbook volumes. Before spending $50 on the official Zentangle kit (available from the Zentangle.com site or from any CZT) and, for the past year, another $50 on the Primer, so many of us took the less expensive introductory experience of purchasing One Zentangle and a stack of inexpensive card stock paper tiles by Peter Pauper Press (probably all purchased via Amazon, too!). Or we used sketchbooks in lieu of tiles. This way, if we didn’t like tangling, we spent less than $30 for book and tools rather than $100 or more to get started. Not one of us regrets having spent that $100 later, though, because the tangling journey made us feel good, and we needed more. My tangling journey began 15 months ago, with One Zentangle a Day and a sketch book that had many of my traditional drawing attempts in its first half. I worked almost exclusively in the journal for several weeks, mostly because I lacked the confidence to ruin even a cheap tile. Sometimes, I drew 3.5-inch squares to simulate tiles. More often, I simply drew a square that was big enough to tangle in, but was either larger or smaller than an actual tangling tile. Perhaps I was deciding whether I liked tangling, or maybe I was sticking to the sketchbook because I needed the sense of familiarity and security of a well-used surface. It took a while before I started using the inexpensive tiles. Much of my tangling was originally done in pencil–just in case I wanted to erase, even though we don’t erase in tangling. Then I moved on to more complex tangling as I learned more patterns and came up with more strings. Gradually, my work improved and I out-grew One Zentangle a Day. Maria Thomas’ challenge on the Mosaic app opened so many opportunities to share where many tanglers started, and why we started. Some people took up tangling because they were established artists wanting to learn a new technique. Many started their Zentangle journey because of a major life change–the loss of a loved one, a move to a very different environment, retirement. Still others came across the Zentangle Method when they were searching for a form of meditation that didn’t force physical stillness. A few were introduced to tangling by a close friend. Some simply stumbled across Zentangle on the internet and thought it was pretty. Most started tangling because of several of these reasons, plus others. But we all started somewhere, fell in love with tangling, and continued to grow through certification seminars or various local tangling workshops. The humble beginnings project got many of us communicating and sharing how the Zentangle Method has helped us personally. Both on this blog and on another blog site (Write of Passage, or dremiller.com), I have shared both why I tangle and what my experiences have been. Among the ways Zentangle has helped me personally is calming my mind, helping me learn (or re-learn) to focus on something, relieving physical and mental tension and anxiety; and providing meditative opportunities to examine my past, including behaviors, and to brain-storm the possible impacts of important decisions. Meditation has helped me explore myself in many ways, with the topic of exploration showing up often in my tangled works. Why do you tangle? How did you get started? If you have been tangling a while, how has the Zentangle Method helped you with your life and your art? How has your art changed? Leave a comment to this post and share your tangling journey! The most important thing to know about Zentangle is that it is meant to foster meditation through the almost hypnotic process of drawing repetitive patterns. The sessions can be as long or short as you want, but the 3.5 inch square “canvas” helps delimit the time factor. Even more focus is created through the use of “frames” and “strings,” which delimit the work area more and create spaces in which to draw different patterns. More on frames and strings another day, though. Today I want to discuss getting started. Materials for tangling are minimal: a fine-line black marker (Sakura’s Micron 01 is the official pen) or other very fine indelible pen, a 2B graphite pencil without eraser, a 3.5″ square paper called a tile (or even a small sketchbook or notebook page–or paper napkin), and a small artist blending stump or tortillion. That’s it. These few materials allow you to tangle anywhere–your car at the school pick-up lane, the grocery check-out line, a lunch space in a cafeteria, at home watching TV, at the bank in Sint Maarten (bring 10 tiles!)–anywhere. Most materials can be purchased at local art shops or from a Certified Zentangle Teacher. Official and supplementary materials can be obtained online or from the official Zentangle site. For getting started, you want the best materials, such as those available from the official site. Good materials can make the difference between enjoyment and frustration, just as with any art form. Plus, you and your efforts are worth the best. However, if cost is a critical factor, substitutions can be made–practice quality tiles such as “Artist’s Tile Set” from Peter Pauper Press (available through Amazon.com), soft graphite pencil from an office supply store (2B softness is recommended for best shading–and a Numer 2 pencil is not necessarily a 2B; it is most likely a 2H, which is much less dark and makes shading more difficult), a very fine tip black marker such as a Pilot marker. The pen should not be a ball-point and should have waterproof ink that dries quickly to prevent smearing as you work. Some pens that I have tried and liked are Staedtler .3 mm pigment liners and Prismacolor .3 mm illustration markers. The Prismacolor can bleed a bit, though, and takes a few seconds longer to dry. Don’t select a marker with too broad a tip, as these can limit the size of the pattern you can draw. Artistic talent is optional. For example, I have trouble drawing stick figures, but I can create a small masterpiece. The artwork isn’t intended to look like anything; Zentangle is non-representational. All you need is the ability to draw a few simple lines and curves. The best way to learn about Zentangle is to participate in a local workshop or class taught by a Certified Zentangle Teacher, or CZT. You can find CZTs in your area by visiting the official Zentangle site, Zentangle.com. (On the island of St. Martin, I will be a CZT by early May, 2017.) The second best way to learn Zentangle is to purchase the Zentangle Primer, vol. 1, available from many CZTs or from the official site. The book and the starter kit provide everything you need to start you off and keep you going for some time. A DVD that comes with the kit helps you learn the most important aspects of tangling quickly–like a quick-start tutorial on a new computer or cell phone. Although the book seems a bit pricey at abut $50, buying less expensive books on Zentangling will not provide you with even half the information, and you will end up investing in the Primer anyway. The kit is also not cheap, but the quality of the included materials is high and the box containing everything is meant to store your materials for a very long time. I went through the “money-saving” process. I didn’t want to spend the money on the Primer, and opted to buy One Zentangle a Day by Beckah Krahula from Amazon. The cost ($23 suggested price, less than $14 on Amazon) is about a quarter of the Primer price, and it was a great book to get me started. However, it only takes you so far before you want–and need–more. So next I invested in a series of thin books, Zentangle # (where # is a book number from 1 to 12), by Suzanne McNeill, CZT. Each of these, set up in workbook fashion and each dealing with a separate aspect of Zentangle–mostly as an artsy craft basis and starting point for hobbies like scrapbooking and jewelry making–is full of ideas and some inspiration. However, each one costs about $9, and there are twelve books in the series. That brings the cost up to $108, with no information about the relaxation and meditation aspects of Zentangle. (Interestingly, Krahula’s book touches on almost all of these craft ideas at a fraction of the cost, and she now has a new book covering crafts and tangling as an art form.) Granted, the full set provides hundreds of tangle patterns, most of which are the author’s creations. But you can get patterns and the directions to draw them for free by visiting TanglePatterns.com. In addition to these, I purchased several Kindle books on Zentangling. In all, I probably spent close to $200 on books. Once I bought the Primer, I realized that it had more information between its covers than all of the others combined–especially on the meditative aspects, which the other books gloss over if they mention them at all. Moreover, you can’t outgrow the Primer. It was designed to inspire and help you grow, both as a tangler and as an individual. Even the most successful CZTs continue to refer back to the book for all sorts of reasons, including inspiration for developing new patterns. 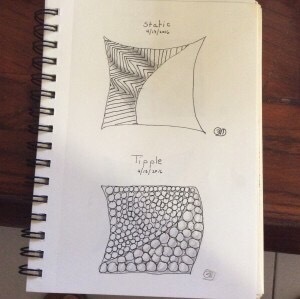 Here is the thing about Zentangle. It is a method. It is a way of calming and centering the tangler. One of the primary tenets of Zentangle is that there are no mistakes. Any mistake is actually an opportunity. For example, tangling is done in indelible ink on a 3.5″ square artist tile. If the pen slips or a pattern is started “wrong,” the stray mark or mis-drawn line should become part of the overall work. The theory is that you can’t re-do aspects of your life; you need to pick up from where you are and do something positive with a mistake. You move forward. For this reason, erasers are frowned upon. Besides, it is next to impossible to erase permanent ink. The best thing to do is work an error into your work in a new and creative way. You may even come up with a whole new pattern! Certainly, tangling is as much about learning new patterns and experimenting with layouts as it is about meditation. Most tanglers practice some patterns (for hours sometimes) in a sketch book before incorporating them as part of a meditative creation. After all, you don’t want a meditation interrupted because you can’t remember how to draw a seemingly complex pattern. A lot of time also gets spent playing around with learned patterns to see how they fit together best, or how to shade a pattern to best set it off in a tile, or even use certain patterns to act as shading or depth enhancement. 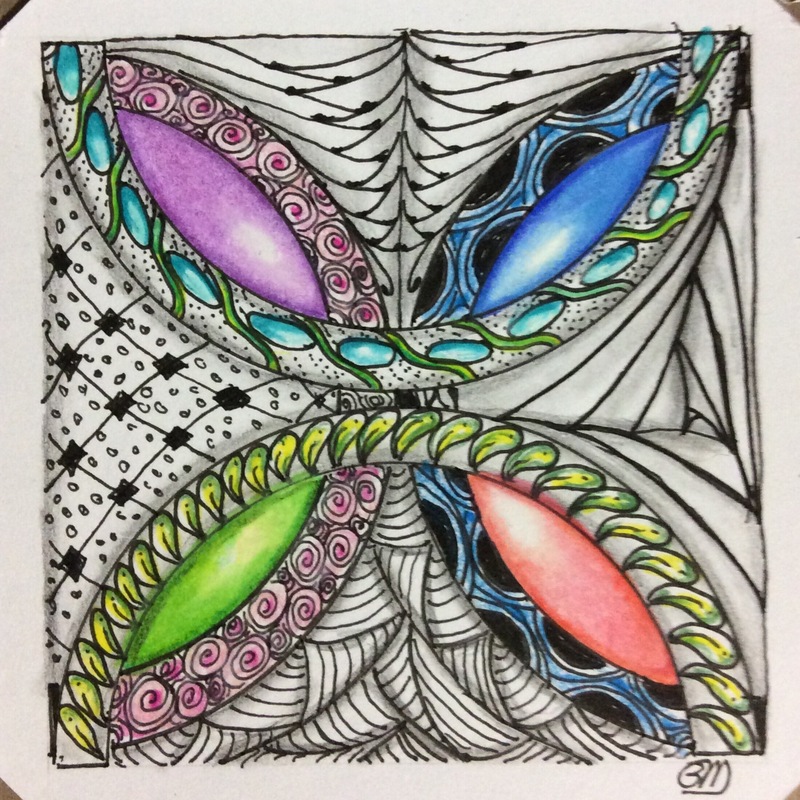 (One Zentangle a Day discusses the tonal values of different patterns to create interest, depth, and texture in a work.) But all this effort is to bring flexibility and ease to a meditation session so you can concentrate on the meditation and let the art happen. More information on Zentangle is coming in future posts.